Internet Explorer 11 will be released sometime this fall – but what if you don’t want users to automatically upgrade? It is always better if you get the chance to test new versions of IE with your most heavily used websites – that way you don’t get hit with tons of support calls when it comes out. You can prevent the upgrade by changing a registry value. Keep in mind this will only prevent it from showing up in Automatic Update. 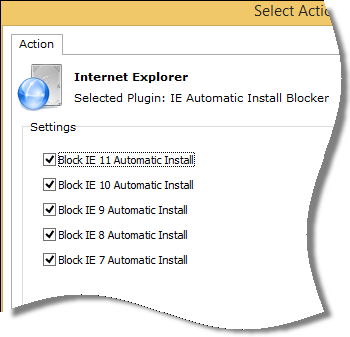 Users can still install IE 11 manually if they wish. I bought Network Administrator 6 months ago. How can I get this update? Just install right over your current copy and it will update itself. We are wokring on an automatic update system, and should have something in the coming months. I was testing the IE 11 Blocking tool in Network Administrator and found that it creates the registry key that it should, but it does not set the value to 1. Each pc that I’ve tested this on is the same way. I see the new key, but the value is set to 0. You are right about this. Something is up with this plugin. My testing here seems to show that all of them need to be checked, or none of them for the change to go through. I am going to get the team to start testing right away and figure out where the issue is. Got suckered in to installing IE11. A freaking nightmare of an upgrade. All my Tools and Bars became microscopic to see. Printing allowed , but, printings were distorted (Both, as visual, then to print. Every time I did manage to print.) Then only way to backtrack I had to leave the App and reboot. Mostly, when I downloaded, the App went almost off screen to the right and therefore was unusable. Tried to go back to IE10. with a Restore. That screwed up my ability to use IE at all. After many hours and reboots. An upgrade to IE10 came back only to immediately try to force me to upgrade to IE11. Windows!!!! Fix the dratted misbegotten thing! That would force the browser to use the IE 8 engine. Either way…I hope MS cleans their act up. This quarter has been a nightmare with their broken patches, and now this IE 11 release. I hope it isn’t too late, but my laptop that is running Windows 8.1 has already been updated to IE 11 before I had a chance to disallow it. I went into the Control panel | Programs and Features | Windows xxxx, and unchecked the IE 11 checkbox. Now I don’t have IE at all. When I went to Microsoft to install IE 10 it told me I already have it. Well, I can’t find it so what do I do now? If I still have IE 10, do you know where it is so I can use it? This doesn’t work for everyone. I’m currently dealing with one user where we’ve used THIS tool, Microsoft’s blocker patch, turned OFF IE update checking in IE10, DISABLED automatic updates on his PC… and every day at 11, IE 11 re-installs. It’s driving me nuts. Do you have your own AU server by any chance? If so, I think windows will ignore the blocker tool in that case. I found from past problems with IE upgrades. That staying one version behind tends to be the best. Web sites unfortunately take their sweet time fixing IE version issues. Especially now that Microsoft has finally decided to go compliant. I have even found some technology sites not setup to recognize IE11 as yet. I think it stands to reason why IE browser stats keep dwindling and Chrome keeps increasing its user base. Users get tired of messing with IE’s finicky nature of compliancy.